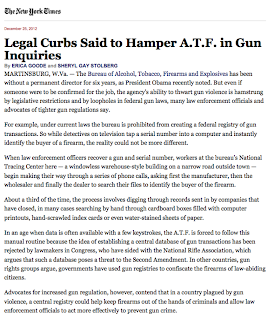 New York Times: Law Blocks ATF's Use of Big Data. "Legal Curbs Said to Hamper A.T.F." The New York Times, like other news sources, is picking up on the fact that the Obama administration is preparing to overhaul how the Federal government learns about the potential for gun violence. The description of the Department of Alcohol, Tobacco, and Firearms (ATF)'s ability to track gun purchases is positively ridiculous, when one thinks about how easy these things are for department stores like Target. If they're really still using printouts and paper, that's a travesty. The worst part, of course, is that the law is written so that the government agency is less effective. After Newtown, the administration is (presumably) getting ready to propose extensively changing the law, which makes sense. 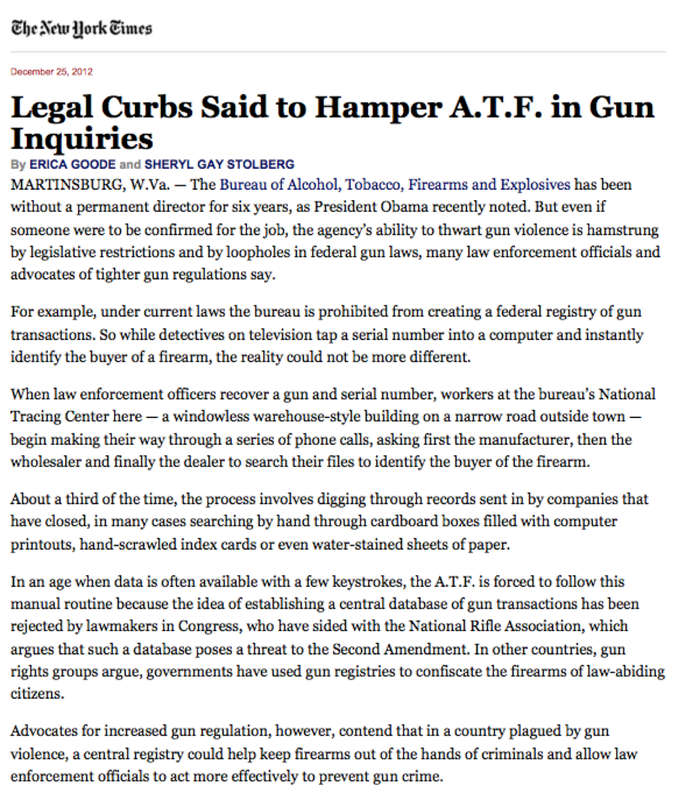 While I can imagine that there are a series of careful provisions that may be put in place, I think the government should make clear that not just ATF, but also state-level social service organizations, should always be given access, at the very least, to the same kind of information that is already possessed by the likes of Wal-Mart and Amazon. Slashdot drew my attention to this Forbes story today, which made me shake my head in sadness. Makerbot has always seemed to have the promise to transform the world -- as Chris Anderson of Wired has described it, "[w]hat desktop fabrication represents is a laboratory for the future, not just of manufacturing but of stuff itself." "3D-Printing Firm Makerbot Cracks Down ..."
However, I think the Maker movement has now found its equivalent of the Internet's Rule 34. 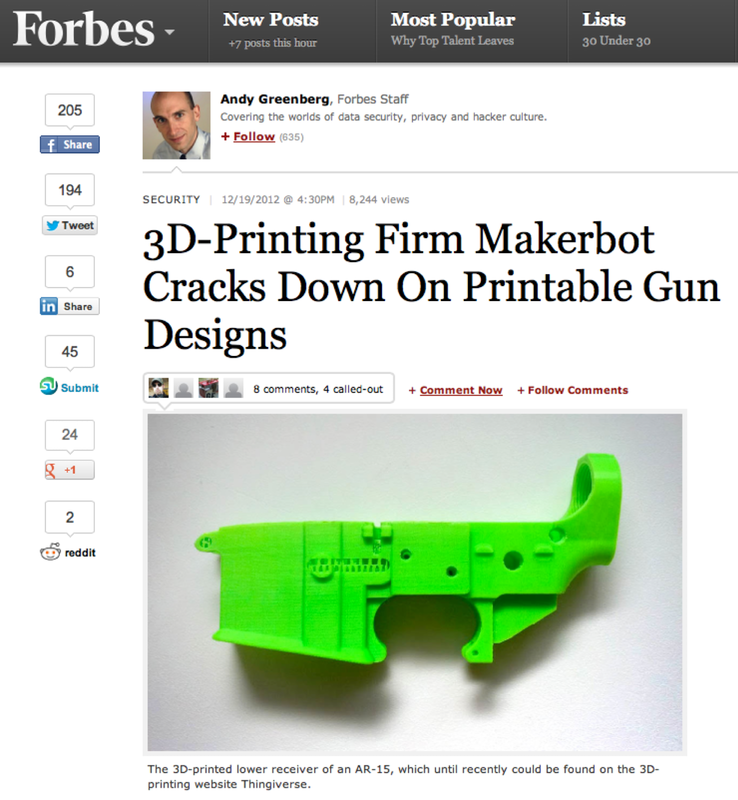 In short, if you give people a way to make things, someone will use it to create a gun, and using Makerbot to create automatic weapons is just about the worst idea possible. I respect the effort to prevent electronic distribution of the designs, but that's not going to cut it, because darknets can move those around. DRM on a Makerbot, which might prevent these designs from being used in the first place, is something that very bright people have been thinking about for a while. But the somewhat dismal history of DRM suggests DRM can, at best, mitigate, rather than prevent such problems. Ultimately, we need to know more about the people prone to doing these things. If someone's trying to print parts to create an automatic weapon, stopping them is important. But so is letting the right person know they're trying to do it in the first place. Lifehacker and Text to Speech. Having to write every day means you end up becoming quite aware of your reuse of phrases, and the errors you make regularly. Lawyers are certainly not immune to the phenomenon. So editing is a skill I have to hone, all the time. 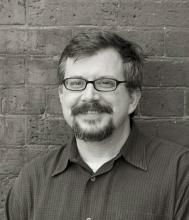 "The best writing sounds smooth—almost like you're speaking, without getting colloquial. So actually listening to your written syntax is one of the best ways you can catch areas with jangling phrasing." Of course, under time pressure with a deadline, it's hard to do that. 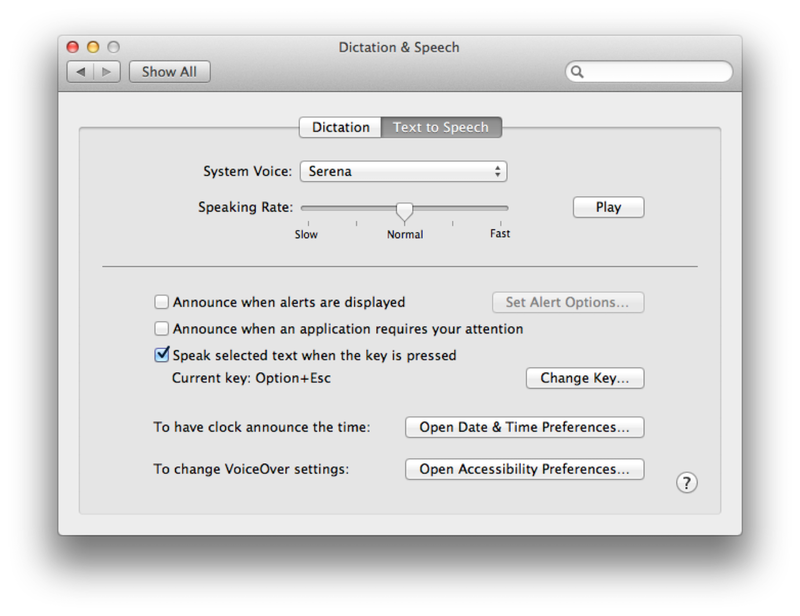 However, one tip I picked up from my brother, is to use a text-to-speech program to make your computer read the text out loud. 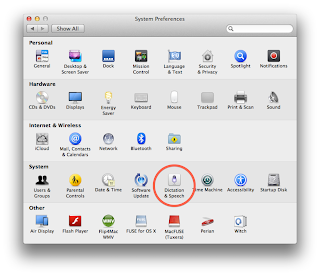 My Mac has, built in, the ability to do that. 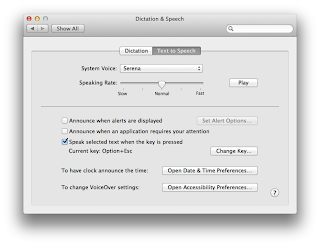 It's called Text to Speech, and it has a remarkable set of features (including a range of accents you can choose for the voice that reads your text). Dear Instagram -- Don't Mess With Kurt Opsahl. One thoughtful friend pointed out a news story about Instagram today. I'd noticed headlines on the subject earlier, but had kind of figured they were all spin by corporate executives. I somewhat subconsciously usually do what Felix Salmon described earlier this week, in that I start with the dual questions: “who is the main source for this story” and “what is that person trying to achieve.” I figured the first answer would be "a Facebook competitor," and the second would be "slam their stock." The main resource for this story was Kurt Opsahl. 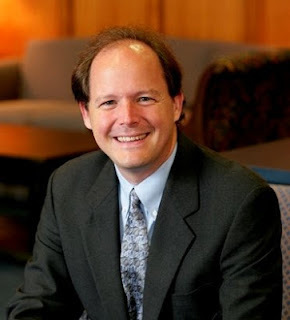 Kurt's a lawyer at EFF, and he's been around for a while -- to put his career in context, he was involved in litigating the Arriba Soft case, which I actually wrote about when I was in law school. When Kurt writes about something, it's safe to say he's generally not engaged in a pump-and-dump stock manipulation scheme. One interesting thing about the Arriba Soft case is that you couldn't have worked on it and not realize that a social network will need to obtain nonexclusive licenses to the photographs its users upload, in order to display those photos and redistribute them -- in the early days of the web, people relied on "implied licenses" to do that, and of course, like all such things in law that are "implied," what the courts really meant was "we've just always done things that way." But social networks, well, they can't exactly rely on tradition, and so they have to have explicit licenses. And their attorneys draft the language as broadly as possible, because frankly, they have no idea what rights they're really going to need even 18 months down the road, and they're careful people trying to play football on a field with moving goalposts. So you get very broad grants of rights in these "clickwrap" types of agreements. 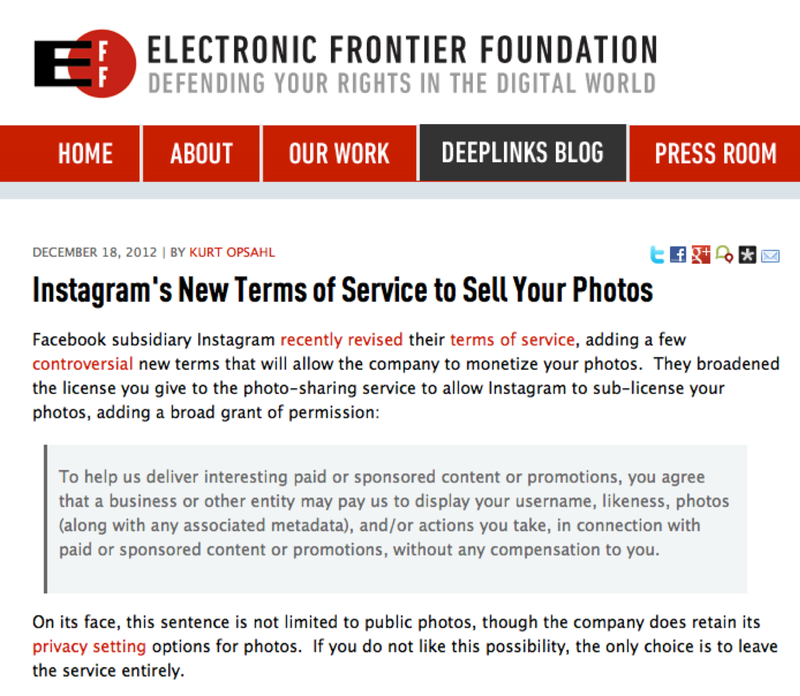 "Instagram's New Terms of Service to Sell Your Photos"
Of course, the real thing the lawyers have to guard against is that their contractual language doesn't let them do something that their competitor can do -- that Google will be able to roll out a killer service because their TOS (Terms of Service) is more expansive than Instagram's, and playing catchup legally will take six months when advantages in the Valley are measured in weeks. What needs to happen, then, is for a neutral party to say "hey, you're going to scare off all the users if you write ridiculous TOS like that, here's what a reasonable such service should look like." Instagram's TOS didn't have any of these -- they aren't even close, and Kurt pointed that out, too. Instagram responded, but hasn't changed anything yet. 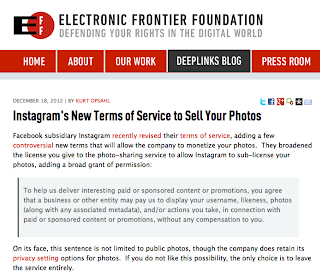 The one thing I'd observe is that, perhaps surprisingly for professionals in the copyright field, is the degree to which the executives at Instagram probably weren't originally all that aware of their terms of service in the first place. In the old days, it's startling to realize how frequently the TOS was an afterthought at a startup. I suspect that Instagram's initial terms deviated significantly from those that a reasonable and prudent attorney familiar with the field would have recommended -- chances are that the drafting "team" was an intern cutting-and-pasting a competitor's TOS into Instagram's HTML. Enter Facebook, and their (very professional) outside counsel. Those lawyers like following rules, and they know that the Instagram terms just didn't cut it. Their clients, locked in a running battle with deep pocketed corporate titans (Apple, Google), want them to push the envelope as far as is reasonably possible, but no further. As those attorneys found out today, that's a tough task when the parameters of the envelope are unknown, and perhaps unknowable. People like Kurt drawing attention to issues like this one is a very big part of how we figure out what will be reasonable going forward. Certainly, it is clear that we should give kudos to EFF -- this is the second day in a row their work is showing up here. I can't imagine this is the end of the road for the Instagram TOS issue -- this one will crop up again and again -- but I'll certainly be keeping an eye out for Kurt's take, if I want to know what the practical consequences are going to be. Obama: It's Time To Use Big Data To Protect Our Children. President Obama interrupted the awesome 49ers-Patriots game last night for a speech. I didn't have time to go over it until this morning, when I started putting the pieces together to figure out what the heck he was talking about. Plus, I needed to read it, rather than hear it, to process the substance. The criticism I heard this morning was that the word "gun" was never mentioned in the speech. How can the President be talking about protecting children and not mention gun control? After thinking about it, I don't think it was an accident. While control of guns may be his goal, I think he's planning on getting there through something on an entirely different level from mere background checks. "Government seeks to shut down NSA wiretapping lawsuit"
President Obama has amazing tools at his disposal to protect America from threats around the world. He gets daily reports on what terrorists around the world are up to, with fairly accurate predictions concerning what they'll do next. He can do so because of the power of the NSA's computers, and because of the careful use of statistics. Anyone who wants to get really specific on the cutting edge of the technology can read about the Electronic Frontier Foundation (EFF) litigation over Room 641A at AT&T's building at 611 Folsom Street, San Francisco. While the lawsuit talks about a lot of computer hardware, like the Narus STA 6400, what the program is really about is the NSA collecting essentially everyone's electronic communications, and analyzing them probabilistically, to anticipate and prevent attacks. I strongly suspect those tools are not used by domestic law enforcement, and as near as I can be certain about anything, I believe those tools are never made available to mental health professionals and social workers. "About a year after Pole created his pregnancy-prediction model, a man walked into a Target outside Minneapolis and demanded to see the manager. He was clutching coupons that had been sent to his daughter, and he was angry, according to an employee who participated in the conversation." "The manager didn’t have any idea what the man was talking about. He looked at the mailer. Sure enough, it was addressed to the man’s daughter and contained advertisements for maternity clothing, nursery furniture and pictures of smiling infants. The manager apologized and then called a few days later to apologize again." "On the phone, though, the father was somewhat abashed. 'I had a talk with my daughter,' he said. 'It turns out there’s been some activities in my house I haven’t been completely aware of. She’s due in August. I owe you an apology.'" 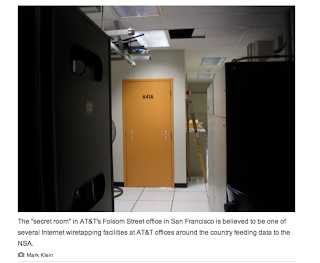 Corporate America knows some of our deepest secrets, without us explicitly telling anyone. The importance of that can easily be overlooked -- the computer system at your local Target has access to incredibly personal information about you that we would never have dreamed of providing to your average social worker or school psychologist. To understand the President's speech, though, I think you have to understand how difficult it was to explain the situation in Newtown, Conn. to my daughter. When she asked me why the flags were at half-staff on Saturday, I started by explaining to her that, just like her stomach might feel bad, or her leg hurt, sometimes our heads get sick, too. She wanted to know why the person wouldn't just go to the doctor if that happened. I told her that sometimes part of the sickness is that the person thinks they can't ask for help. And that we all depend on one another to ask each other for help when we can't handle something, to keep us all safe. I then told her that we are all sad because someone got sick like that on Friday. And that the person decided that the only way they could get better was by hurting themselves, and a whole lot of other people, people who are just like her Mom, her Dad, and her, in a small town just like ours. And that we lowered the flags because we are all so sad. It was still on my mind that evening, when I sat down with a good friend who's in education. We were talking about when we can take action based on information we receive -- I explained the oath lawyers take in California, and he talked to me about what it means to be a mandated reporter. We both reflected on how our options are limited if someone won't ask for (let alone accept) help. But of course, with modern technology, we don't have to sit around waiting for someone to ask for help. Your local Target has all the information needed to predict when you're pregnant, and the same types of databases probably light off like a Christmas tree when someone's thinking about taking the kind of action Adam Lanza took. I suspect it's routinely possible to use the same computer systems to alert local school and social workers when something like Newtown's about to happen -- perhaps far earlier than any of us suspect. If you think of government using such databases in as ominous terms as Room 641A is described in the EFF litigation, the whole situation probably freaks you out. It's not hard to see why. Think for a moment -- if the government can just go buy the same information about you as your local Target can -- about who's pregnant -- imagine the use of such information in, oh, say, the abortion context. Now, there's no invasion of a woman's right to private communications with her doctor -- the government can know a woman's thinking about getting an abortion long before the event occurs, without invading that relationship at all. Legislators on both sides of the aisle are aware of how politically explosive that technology's use by government could prove. The consequences of tearing down the anonymity veil are, at the very least, unpredictable. No-one has wanted to walk down that road. "[E]very parent knows there is nothing we will not do to shield our children from harm." "This is our first task -- caring for our children. It’s our first job. If we don’t get that right, we don’t get anything right. That’s how, as a society, we will be judged." "And by that measure, can we truly say, as a nation, that we are meeting our obligations? Can we honestly say that we’re doing enough to keep our children -- all of them -- safe from harm? Can we claim, as a nation, that we’re all together there, letting them know that they are loved, and teaching them to love in return? Can we say that we’re truly doing enough to give all the children of this country the chance they deserve to live out their lives in happiness and with purpose?" "I’ve been reflecting on this the last few days, and if we’re honest with ourselves, the answer is no. We’re not doing enough. And we will have to change." "Since I’ve been President, this is the fourth time we have come together to comfort a grieving community torn apart by a mass shooting. The fourth time we’ve hugged survivors. The fourth time we’ve consoled the families of victims. And in between, there have been an endless series of deadly shootings across the country, almost daily reports of victims, many of them children, in small towns and big cities all across America -- victims whose -- much of the time, their only fault was being in the wrong place at the wrong time." "We can’t tolerate this anymore. These tragedies must end. And to end them, we must change. We will be told that the causes of such violence are complex, and that is true. No single law -- no set of laws can eliminate evil from the world, or prevent every senseless act of violence in our society." "But that can’t be an excuse for inaction. Surely, we can do better than this. If there is even one step we can take to save another child, or another parent, or another town, from the grief that has visited Tucson, and Aurora, and Oak Creek, and Newtown, and communities from Columbine to Blacksburg before that -- then surely we have an obligation to try." "In the coming weeks, I will use whatever power this office holds to engage my fellow citizens -- from law enforcement to mental health professionals to parents and educators -- in an effort aimed at preventing more tragedies like this. Because what choice do we have? We can’t accept events like this as routine. Are we really prepared to say that we’re powerless in the face of such carnage, that the politics are too hard? Are we prepared to say that such violence visited on our children year after year after year is somehow the price of our freedom?" The President knows we are not powerless -- we are anything but. He knows the computer system at the Target located at 7 Stony Hill Road, Bethel, Connecticut, 8.5 miles from Sandy Hook Elementary, had a better idea of what was about to happen than any social worker or educator in the State of Connecticut. And he's had enough of tying the government's hands. This could make anyone afraid -- how will such information be used? Is this Orwell's 1984? The concern must be about how such information will be used, and our fear is that it will be misused. I submit to you, though, that we as Americans can create a solution to this problem -- for managing such incredibly difficult problems is what we do. I was struck this morning, after watching Disney's Prep & Landing over the weekend (if you haven't seen it, you should, it's hilarious) about how our artists reimagine Santa Claus in the 21st Century. Rather than magic, Santa's operation is run by a charming, elven-staffed combination of NASA, the CIA, FedEx, and SOCOM, all rolled into one. And why? For the kids, of course. These elves coming down the chimney with night vision goggles and sparkle ornaments are hardly fear inducing -- after all, we lay out cookies and milk for them, and carrots for the reindeer. So that brings this back to the subject matter of this post. What's behind the door to Room 641A? It's the real world's version of the technology and organization from Prep & Landing. The power of that technology may be misused. But we as Americans specialize in organizing ourselves to wield that kind of power. When we think of the power of Santa, our artists imagine the bureaucracy it would take to get something like that done the right way -- because that's what we as Americans happen to be pretty good at. If there isn't a set of agencies, experts, lawyers and officials designed to oversee the application of this technology, of this information, and the use of the probabilities it calculates, there soon will be. And it will probably work pretty darn well. It's not that Adam Lanza couldn't get help from anyone. It is that we as a nation refused to examine the data. America will, no doubt, be a much different place when your town advertises, via postcard, about free counseling clinics, and the postcard is sent to only one home. Our President's point, however, is that our freedom does not depend on our government ignoring the very information driving the core of American business. Innocent lives depend upon us paying attention, and protecting the vulnerable must be our starting point, no matter how serious the consequences will be politically. The President, not being specific? Hardly. 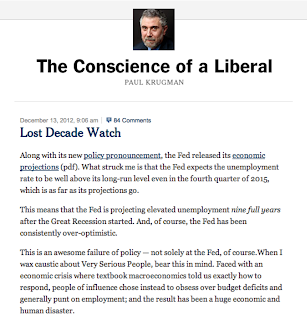 Paul Krugman: "Brad, Don't Get Too Excited." Paul Krugman, "Lost Decade Watch"
Mr. Krugman is considerably less excited than Brad DeLong about the changed position of the Federal Reserve concerning explicit inflation targeting linked to unemployment. "Awesome failure of policy" is rarely something I want to hear from a Nobel Prize Winner in Economics. "While we wait to observe the impact of the policy, we can nonetheless appreciate the pragmatism and intellectual flexibility of the FOMC. Though behind the curve for much of the recovery, it has evolved relatively quickly over the past year in response to changing data and a changing academic debate. Perhaps it will evolve a bit more if conditions demand it." "THE FEDERAL RESERVE: THREE YEARS LATE--BUT THEY DID IT!!" 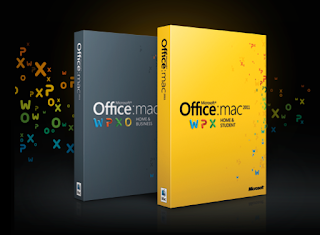 I'm a fairly heavy user of Office for Mac, and "Outline View" in particular. For structuring a Table of Contents, it's essential. One nice tool is the ability to promote or demote particular levels of the outline without taking your hands off the keyboard. Because I can never remember the shortcuts to do so myself, I'm putting them here for my (and everyone else's) benefit. 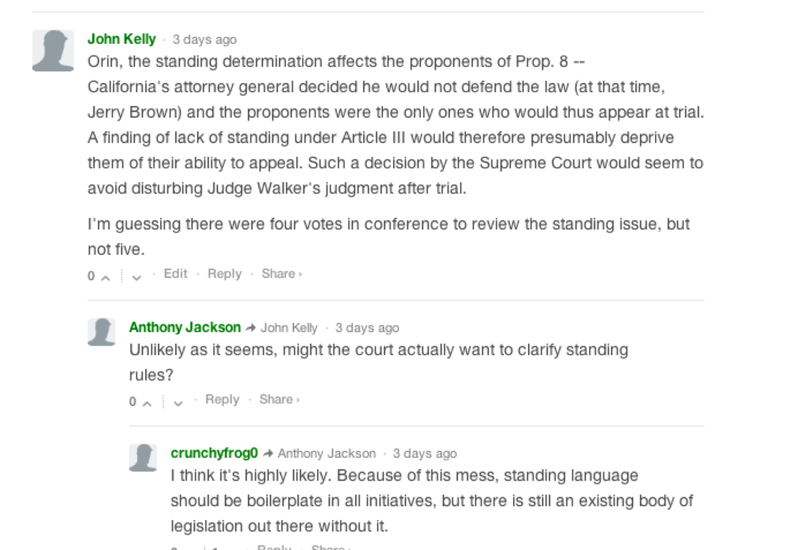 Standing, Blogging, and Prop 8. From time to time I post on other people's blogs. I used to believe blog comments were a one-way conversation with the blogger. That's not really why I do so any more -- the reason now is that, while there's something interesting on the blogger's site, I generally want to read what their other readers think of a particular point -- the comment threads can become Condorcet juries. Some blogs are especially useful for that purpose. One is the Volokh Conspiracy. From "Supreme Court Grants Prop 8, DOMA Cases"
I posted a message over there on Friday to Orin Kerr, who is an expert on 4th Amendment case law regarding the Computer Fraud and Abuse Act. 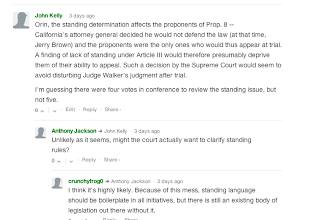 The specific post concerns standing to defend California's Proposition 8. The nice part was that twenty-two other comments on the message helped me take my own thinking on the subject a couple of more steps down the road, so to speak. The issue being discussed, standing in the context of the Prop. 8 case, is a big deal for lawyers, but its importance to the public at large is questionable. For instance, Margaret Warner of the PBS Newshour referred to it as the "so-called" standing question on Friday's broadcast. I tend to think the standing question is important, but that the issue will probably prove to be merely interesting rather than determinative. I think we as Americans believe courts have the inherent power to hear constitutional challenges of this type, which I think is the pillar of truth at the core of Marbury v. Madison (1803), 5 U.S. 137. That inherent power cannot be fairly exercised without advocates for either side in the courtroom. Indeed, if the Prop. 8 advocates are barred from the room, the constitutional question would, ultimately, be a de facto decision by the executive branch, not the judiciary. We as Americans have more or less accepted that the ultimate arbiters of all constitutional questions will be the courts. Executive and legislative interference with the court's ability to do so tends to be considered game-playing by the courts, and the Supreme Court appoints counsel to make such "orphan" arguments about once per term. The Prop. 8 case may thus become something of a natural experiment concerning the inherent power of the courts to hear disputes despite efforts by the executive and legislative branches to deprive them of the ability to do so, which should prove interesting to civil procedure scholars, if not ultimately proving important in deciding the case. The Economist took at look at the newspaper industry this week. 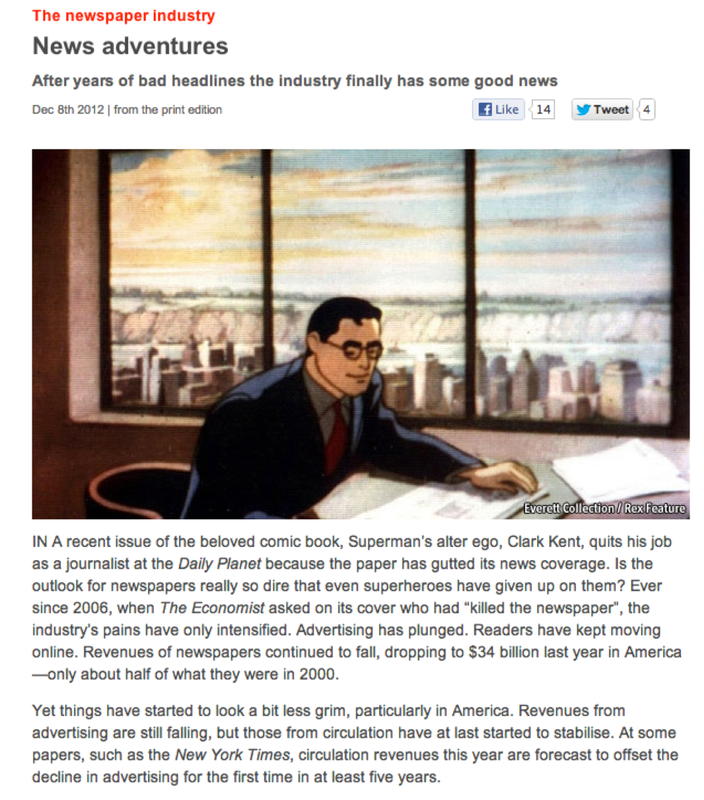 They touched on their article from 2006, which noted the dire future of the industry (a prediction that has come true). However, their evaluation is that the future looks less grim six years on, mostly due to the advent of paywalls. The unusual feature of newspapers, like most media, is that they have been counter-majoritarian in the past. An editor would undertake a campaign that was unpopular, and change the minds of his readers -- often if not always to the betterment of the community. Businesspeople took note -- a successful but unpopular corporation could use the same vehicle to burnish its reputation through a media campaign -- or, better yet, avoid that problem entirely through careful advertising over time. This created an economic link between local business and the paper, which had significant consequences. The close connection between local businesses and a newspaper built on advertising meant many small towns had an essentially conservative institution that nonetheless valued ideas and the importance of the 1st Amendment. The small town newspaper could therefore be an important bulwark against insularity and parochialism across the United States. The new economic model, though, is different; it is based on subscriptions, not advertising. The newspaper must now cater to its readers to a greater degree, and potentially their prejudices. The Economist points to the future of newspapers as being similar to the future of radio, in a somewhat unconcerned fashion. It is understating the matter to suggest that there are merely "critics" of the changes to radio. Of course the counter-majoritarian feature of media in general has not gone away; the reasons businesses need to reach customers have not changed, merely the vehicle has (Google or Facebook, instead of the New York Times). However, there is a greatly diminished local element to such technologies -- one of the cast of characters in a small town, the newspaper editor, has no analogue for a web site. This has happened in other industries -- the local banker has been replaced with a Director of Business Development dispatched from the city, and a nurse-practicioner working at a distant HMO's facility substitutes for the local GP. The services (banking, health care, advertising) are perhaps provided more economically, but the open question is whether the community is diminished when its most powerful, insightful, and respected members, the banker, the editor and the doctor, are subjected to new economic pressures from unexpected directions. The radio model, thus, should be cause for concern for newspapers -- it may be more a poisoned chalice rather than a magical elixir. Sonoma County vs. Odessa, Texas. 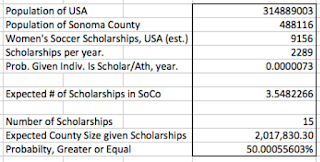 I was thinking this morning about a Press Democrat article from February of this year, which discussed high school athletes who received scholarships from Sonoma County. The striking element of the story was the number of female student-athletes receiving scholarships to play college soccer. Fifteen (15) seniors signed letters of intent to play women's soccer at the college level. 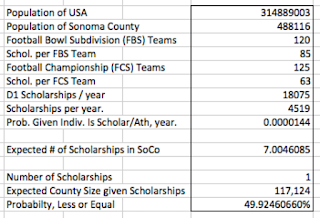 By way of contrast, there was only one Division I football scholarship offered, and that was to attend an FCS school, UC Davis. "High School Girls Soccer Reigns on National Signing Day"
In Sonoma County, the importance of women's soccer is almost a given for the County's 488,116 residents, so this outcome isn't considered too unusual. 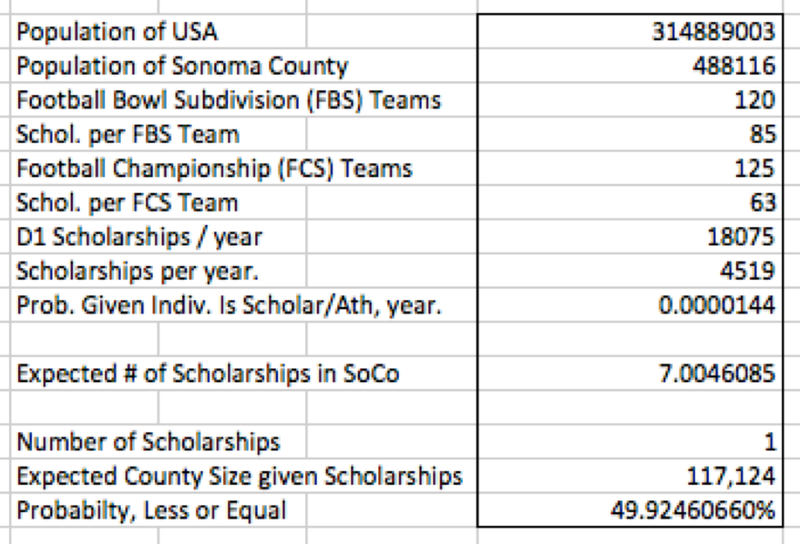 However, if football and soccer scholarships were evenly distributed across the country, you'd expect Sonoma County to generate seven (7) D1 football scholarship players every year, but only 3-4 women's soccer scholarship players. Sonoma County's lack of D1 football players isn't necessarily that surprising -- the county is relatively remote, and Northern California's football culture is more concentrated in Sacramento and the East Bay. While there are good athletes here, this isn't a place like San Diego, with great athletes across the board. Scouts thus come to the area infrequently, so a D1 player on the bubble is less likely to be noticed here, even when that caliber of athlete exists. 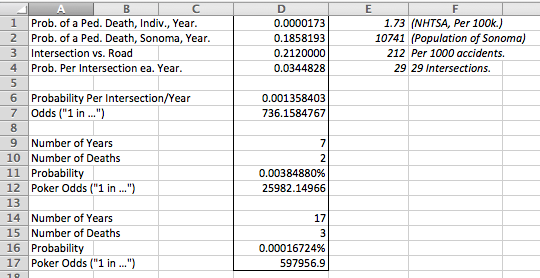 The reason the football data is interesting, though, is because it disproves the "San Diego" model. Sonoma County isn't like Contra Costa County, where the success of Danville and San Ramon in soccer is complemented by the football prowess of De La Salle. 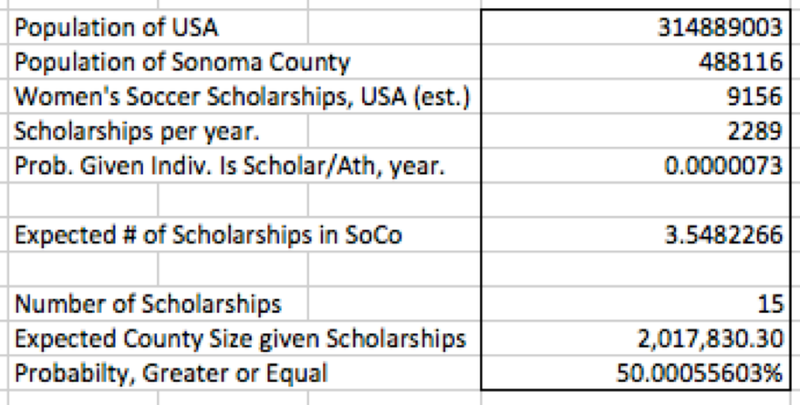 If that rule were true, you'd expect almost no women's soccer scholarship athletes to come out of Sonoma County. Expected County Population1 D1 Football Scholarship. A normal county that produces only a single D1 football player is about 117,124 people, or somewhere between the size of Humboldt County (134,623) and Mendocino County (87,553), the 35th and 38th largest counties in California. However, a normal city that produces 15 women's soccer scholarships is about 2,017,830 people, or somewhere between the size of Houston (2,145,146) and Philadelphia (1,536,471), the fourth and fifth largest cities in the U.S.
Of course, you'd kind of expect there to be a women's soccer magnet somewhere. You know, the equivalent of, say, Monongahela, Pennsylvania. Or, perhaps, Odessa, Texas. If there is, it looks like it might very well be Sonoma County, California. 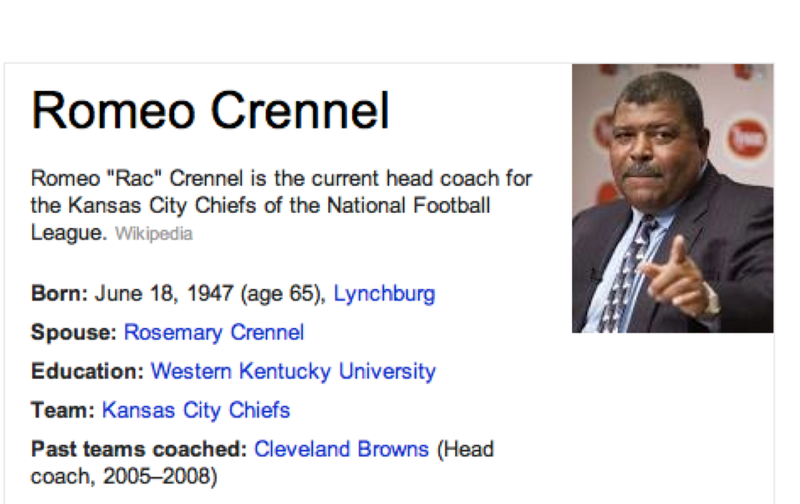 Romeo Crennel is Good at His Job. Romeo Crennel is good at his job. This statement flies in the face of conventional wisdom -- Crennel is considered something of a failure by that standard. He's only had one winning season in ~5 seasons as a head coach, and his team this year is just 2-10. That Romeo Crennel displayed amazing leadership qualities. I like Merril, and I am impressed with Romeo Crennel's handling of the situation, but I don't think the analysis is right. First, I can think of ten different skill sets that are all designed to deal with the horrible situation that occurred at the Chiefs' facility -- cop, firefighter, EMT, doc, shrink, nurse, lawyer, judge, priest, and rabbi, just to start. These kinds of things are routine for those jobs. Each one of those individuals has a skill set designed to deal with a specific part of that situation. So Merril's wrong on that one. The second is whether the win is inspiring. NFL players are professional athletes, but they are really professional entertainers, like stage actors. The byword of those fields has always been "the show must go on." They did their jobs as entertainers -- commendable, but something more than that? Finally, on whether this is a display of leadership by Crennel -- Crennel did his job, and did it well. It is common to overlook that a coach like Crennel is the operational manager of an organization worth approximately a billion dollars. That organization's value is based on holding eight events (games) at their stadium each year. Romeo made sure the game took place, and he deserves a lot of credit for that. Part of being a coach is being a leader, but Hoge heralding Crennel as a great leader misses the schwerpunkt. The important question, the tough point, is why was Crennel able to lead? Why is Romeo Crennel good at his job? I can't tell much, from thousands of miles away, about Romeo Crennel's personality, or the way he interacts with people. But I'm probably right about the following point -- Romeo Crennel has the capacity to form intimate relationships -- that he is able and capable of being affectionate towards people. Such a capacity is the single best predictor of success in every aspect of life. I think it's the reason Jovan Belcher sought him out, the reason his players gravitated to him in a crisis, and the reason the Chiefs were able to go to work on Sunday. Romeo Crennel has a "skill set," for lack of a better word, to deal with such situations -- and that skill set, not winning, is the sine qua non of coaching. Conversations with History: Elizabeth Warren. For anyone interested in what happens next in American politics, watching this video makes an awful lot of sense. Elizabeth Warren's path through life has been anything but conventional, and was pretty much the last thing I'd ever expect for a law professor from Harvard. The interview is long (an hour) but the first ten minutes are probably the most important. Elizabeth Warren is already a prominent figure at this point in her career, but isn't as overtly political as she perhaps is today. The talk is very candid, and she goes into her experiences growing up, her somewhat roundabout education, her early days as a solo law practitioner, and how she began her research into bankruptcy law. Perhaps the most amazing thing about this interview is that it was conducted before the start of the Lesser Depression, and how prescient her views are given what's taken place since. Regarding the interviewer, the Institute for International Studies at Berkeley has been conducting this series for more than 25 years, and Harry Kreisler does a great job of moderating the interviews. I've watched a set, and they're quite something. All are available on YouTube, from Abdullahi Ahmed An-Na'im to Howard Zinn. iPhone backup, iCloud and local, at the same time. 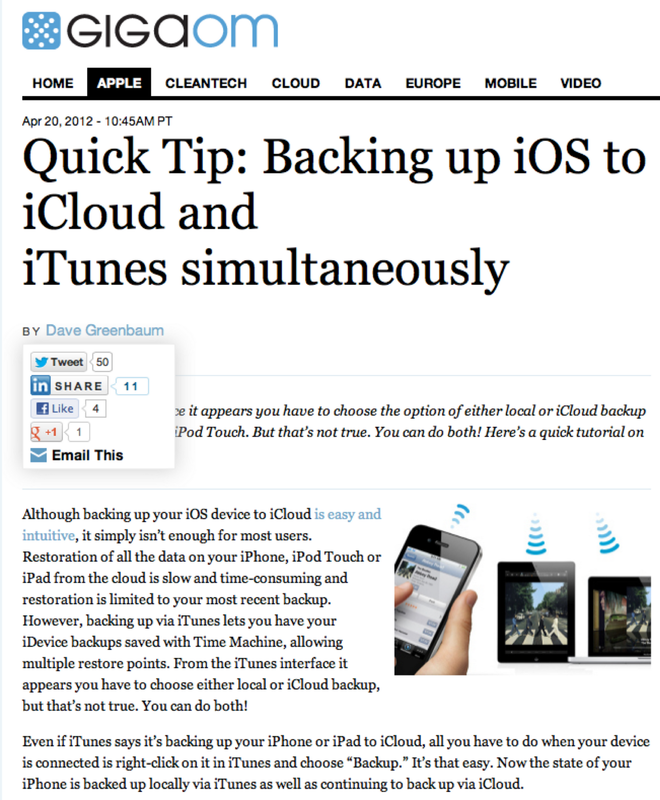 Very handy tip from GigaOM. If you're like me, backing up your iPhone is a big deal. I do it regularly, because I use "Missing Sync for iPhone" for its call log feature, which links up (after some scripting) very nicely with Timeslips (a common legal billing program), and which depends on a local backup to obtain the call data. Since the advent of iCloud, I've started backing up using the service. 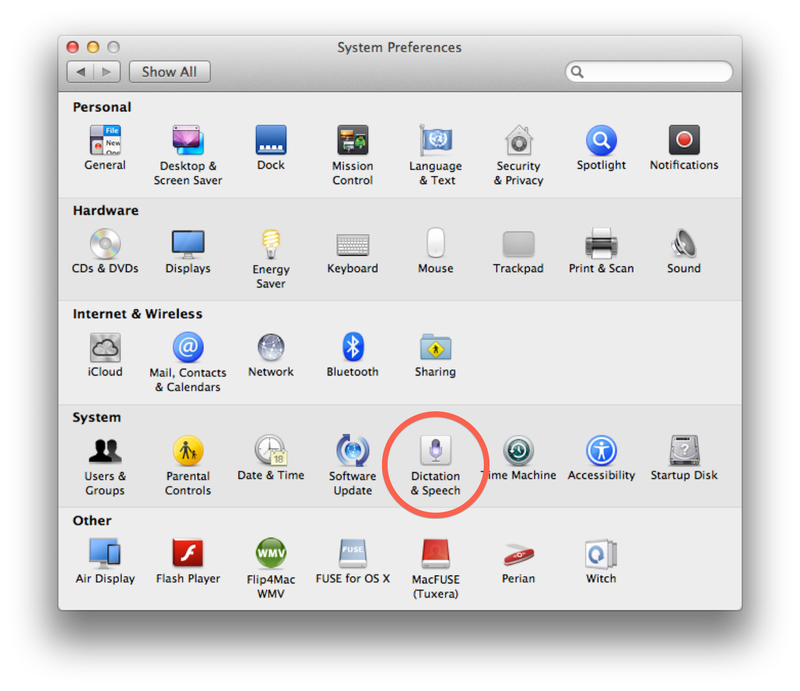 It's great -- I don't have to plug my phone in to my Mac to make sure I have daily backups. However, I still need that local backup for call logs, and further, while iCloud is very useful for backups, restoring from it can be slow, and it only keeps one backup. But using Time Machine on my Mac means that there are a lot of snapshots of the condition of my phone, which is good for rollbacks if necessary. 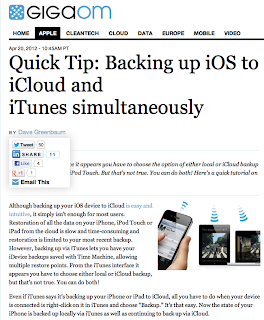 So, this advice today, on backing up to both iCloud and locally, is pretty useful. Just right click on the iPhone icon in iTunes, and the option's right there. Nice! Thanks GigaOM! Secession is a bad idea, full stop. The Battle of Gettysburg, Pa. July 3d., 1863, by Currier and Ives. 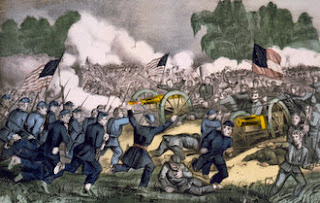 "'The combat they had endured for almost 24 hours was characterized by an intensity of firepower never previously seen in Civil War battles, as the entire landscape was flattened, all the foliage destroyed. An example of this can be found in the Smithsonian Museum of American History: a 22-inch stump of an oak tree at the Bloody Angle that was completely severed by rifle fire. There was a frenzy to the carnage on both sides. Fighting back and forth over the same corpse-strewn trenches for hours on end, using single shot muskets, the contending troops were periodically reduced to hand-to-hand combat reminiscent of battles fought during ancient times. Surviving participants attempted to describe in letters, diaries, and memoirs the hellish intensity of that day, many noting that it was beyond words. Or, as one put it: 'Nothing can describe the confusion, the savage, blood-curdling yells, the murderous faces, the awful curses, and the grisly horror of the melee.'" Prof. Shaun Martin & 5th St W.
a nice family. At least he's balding. Shaun Martin's a nice guy. I don't know him personally, but I do have evidence to support that fact. Shaun teaches law at the University of San Diego, which should make anyone dislike him as a threshold matter due to pure jealousy. However, Shaun drags himself nearly daily away from his splendidly magnificent career choice to maintain a blog where he reviews the latest (when I say latest, I mean "last few hours") decisions from the California Courts of Appeal, and the 9th Circuit. He usually picks out one case, links to the opinion, and explains (very briefly) an interesting or useful point the case illustrates. Sometimes it's a technical civil procedure point, sometimes it's a nuance of criminal law, and sometimes it's an example of lawyers behaving (very) badly. It is consistently interesting and very useful as a legal research tool. Back around Halloween, Shaun picked up on a case from the California Court of Appeal entitled Tuolomne Jobs & Small Business Alliance v. Superior Ct. (Cal. Ct. App. - Oct. 30, 2012). The case concerns projects that are approved by the voters in a voter-sponsored initiative, which are exempt from having to prepare an environmental impact report. So far, so good. As some California political types are doubtless aware, that procedure's been used by business (Wal-Mart is an example) to an increasing degree in California, where paid signature gatherers get fifteen percent of the voters sign a petition supporting their construction project. City Councils, instead of putting the measure on the ballot, then adopt the initiative as a statute in lieu of an election. Question -- do you still get out of the environmental impact report then? The Tuolomne Jobs court says "No." Shaun thinks the California State Supreme Court will take this one up (and he's probably right, because this is a big deal), and will probably adopt the Tuolomne Jobs opinion, which will diminish (but I doubt stop) the business-oriented use of the local initiative process. No appeal has yet been filed, but I suspect it will be coming in the next thirty days. Nice catch, Mr. Martin. The availability of an initiative, from a Sonoma perspective, came to my mind because of what's taking place at 5th St W at Studley. The Sonoma Index-Tribune did an outstanding writeup on the City Council's meeting, which included a statement from the (outgoing) Public Works director stating that the City of Sonoma "believes existing conditions are safe” and expressed the belief that no structural changes “can make them safer," but at the same time stating that there is reasonable cause to evaluate the intersection further through a new traffic study. The Council did not commission a new traffic study (yet) despite the statement from the Public Works Director that such a new study is reasonable. It may very well be that the City Council is waiting until its newly elected members are seated in December before tackling this issue -- but this is not something that should go very far beyond then, and it's nice to know that something like the initiative process is available in a worst-case scenario if the City persistently fails to act. Sonoma County vs. Welwyn Garden City. Sonoma County is relatively proud of its planning heritage; Rohnert Park, south of Santa Rosa, was founded at the same time as the Levittowns, and was marketed as a new middle-class city. Occasionally, local cheerleaders will refer to it as the first planned city in the United States, which flies in the face of history but which locals generally regard as a mostly harmless bit of boosterism. I say "mostly harmless" because Sonoma County's self-imagined role as a trailblazer means it tends to miss the fact that its problems are predictable ones that have occurred elsewhere. For a time when I was in the 4th grade, I went to the Templewood School, in Welwyn Garden City, Hertfordshire, England. For someone from Sonoma County, California, this was an interesting experience, for a host of reasons. One reason, though, that I didn't realize until much later, is that Sonoma County's general plan (consciously or not) has been, is, and will be modeled on the garden city movement, and Welwyn Garden City is one of the movement's best examples. 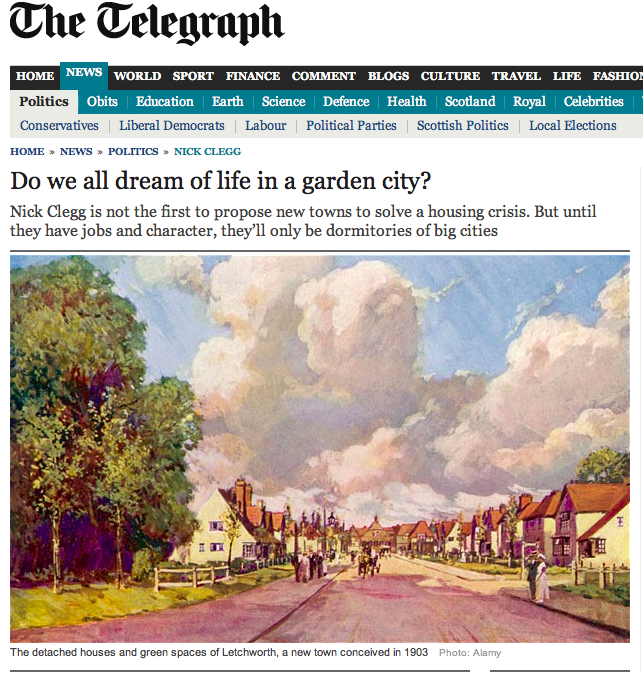 "Do we all dream of life in a garden city?" The Garden City movement was really inspired by a single novel -- Edward Bellamy's Looking Backward. The details aren't germane to this post, but Looking Backward describes what today would be called a socialist utopia. 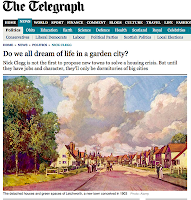 Sir Ebenezer Howard took those ideas and ran with them, and decided that creating the world Edward Bellamy described meant that planned, self-contained communities, surrounded by greenbelts, should be created. These cities would have approximately 30,000 residents, and would contain proportionate areas for residences, industry and agriculture. 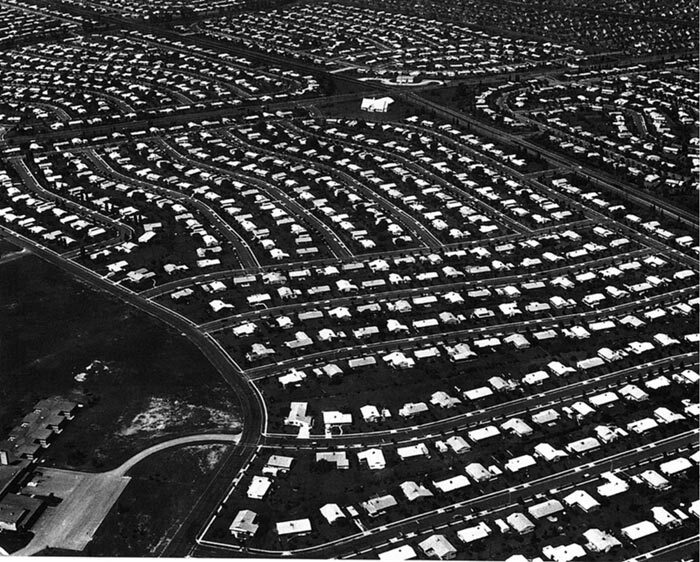 Howard envisaged a cluster of several garden cities as satellites of a central city of 50,000 people, linked by road and rail. As socialist utopias, the garden cities were something of a failure; property values tended to rise, and blue collar workers were forced out in favor of middle class families. Industry and agriculture would thus suffer due to higher labor costs, and they moved out, too. 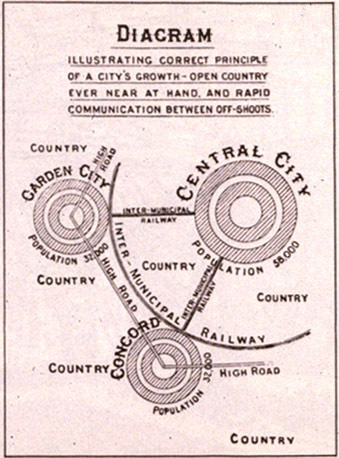 The garden city ended up becoming a garden suburb, built around transport (roads, and importantly railroads) that connected it to a nearby city where its residents work during the day -- which ultimately made the garden suburb economically dependent, undermining the whole point of the movement. Sir Howard's first such city, Letchworth Garden City, was thus a modest economic success, if not much of an immediate political one. It was followed by Welwyn Garden City. 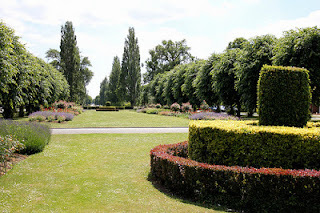 Howard's disciples sought to make Welwyn even more beautiful than Letchworth, and as a former resident, I can tell you, they succeeded to an amazing degree. As a fourth grader, I remember walking through small wooded areas, and then through winding, calm, pleasant neighborhoods on my way to Templewood. 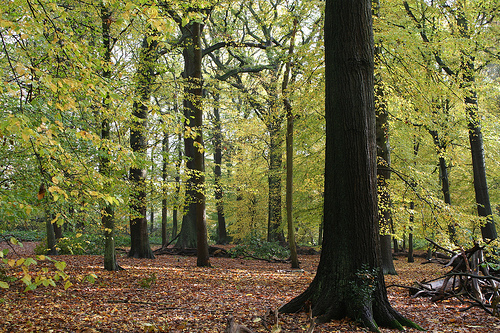 The school itself backs up on to Sherradspark Wood, which is something right out of the Lord of the Rings. Those rare times I rode in a car, the enormous, green open spaces left an indelible memory -- I still remember the view along the city's Parkway, which I (much later) learned is considered one of the finest urban vistas in the world. The unintentional economic success of the garden cities was not missed by the denizens of Whitehall. 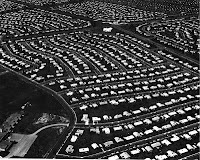 In the aftermath of the Second World War, they embarked on a program of creating new towns, which, for an American audience, is something like the English version of Levittown. Of course, Levittowns are not socialist utopias. But the irony is that cities designed to be socialist utopias ended up being exactly what the U.K. middle class was looking for (Welywn Garden City itself was "back designated" as one of the new towns). The garden cities' successors, whether new towns or Levittowns, reflect the same design aesthetic that made Letchworth Garden City and Welwyn Garden City popular -- which brings us back to places like Rohnert Park, California. The basic problem of the garden city movement didn't go away just because American developers began using it. American planned communities, due to their amenities, landscaping, and design proved very attractive to the middle class--the working class rarely even got a foothold. Those new middle class residents commuted, and thus the planned community became ever more economically dependent on transport links. In Welwyn Garden City, this was no problem -- the city's rail station, on the East Coast Main Line connecting London to Edinburgh, heads straight into King's Cross (20 miles away), where it's (from a Sonoma County resident's perspective) easy to get anywhere in London in short order. Sonoma County isn't on the U.S. equivalent of the East Coast Main Line. It's on the Northwestern Pacific, which, by way of contrast, was shut down by the U.S. Federal Government in 1999. Sonoma County has nothing like Bay Area Rapid Transit (BART), which the eastern part of the San Francisco Bay Area uses to emulate the success of Welwyn Garden City's access to the East Coast Main Line. Sonoma County's main roadway, US-101, had, by the mid 1990's, become chronically jammed by traffic. Economically, the structural weakness this created was concealed (to a degree) by the consequences of rampant real estate speculation and asset price inflation. When the housing market crashed, the economic prerequisite necessary for the success of a garden suburb, excellent transportation links, wasn't there, and Sonoma County's unemployment went from 2% to 11%. Other parts of the Bay Area, with high quality transportation, weathered the storm better. Press Democrat, August 30, 2012. Due to the lack of rail transport, Sonoma County has become nearly entirely dependent on roadways and cars. The roads are now in the worst condition of any in the San Francisco Bay Area, and inter-county travel by cars is one our most significant sources of greenhouse gas emissions. 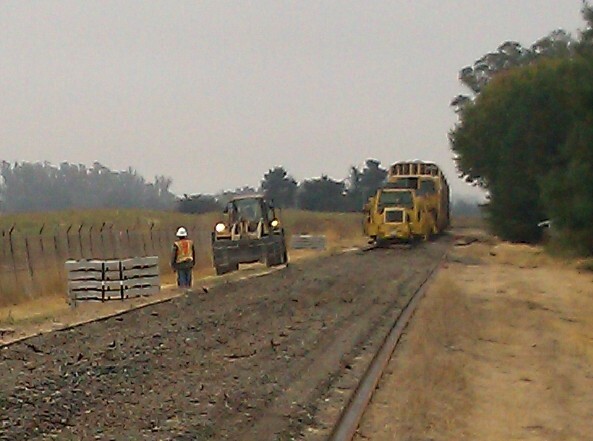 Sonoma County is backing into the railroad solution; it has begun construction on the Sonoma-Marin Area Rail Transit (SMART) line. The surprise, perhaps, though, is that the solution is fifty years "after the fact," so to speak. There are other interesting questions that spin off of the initial premise that Sir Howard had in founding Letchworth and Welwyn Garden Cities. The unintended consequences of applying an urban design model built upon the premise of utopian socialism has broader effects than merely kicking Sonoma County in the teeth economically over the last ten years -- but those are other posts for other days. 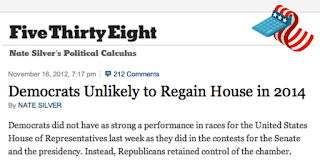 So, Nate Silver has picked up on the House of Representatives result, arguing the Democrats underperformed. This contrasts with Paul Krugman's "The Democrats are the party of government" argument. 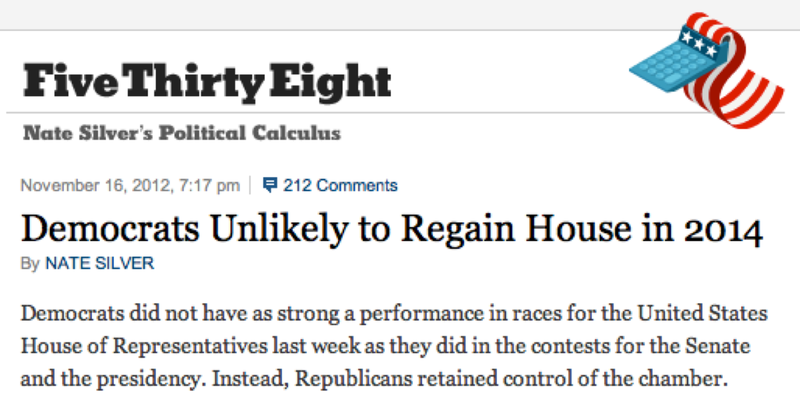 Nate Silver seems to catch on that, in an equally split vote, the Republicans will tend to control the House. This seems to support the Republicans as the party of government, but that's really a minor argument compared to the bigger issue, which is the fact that it is unlikely the Democratic Party will recapture control of the House until 2022 at the earliest. 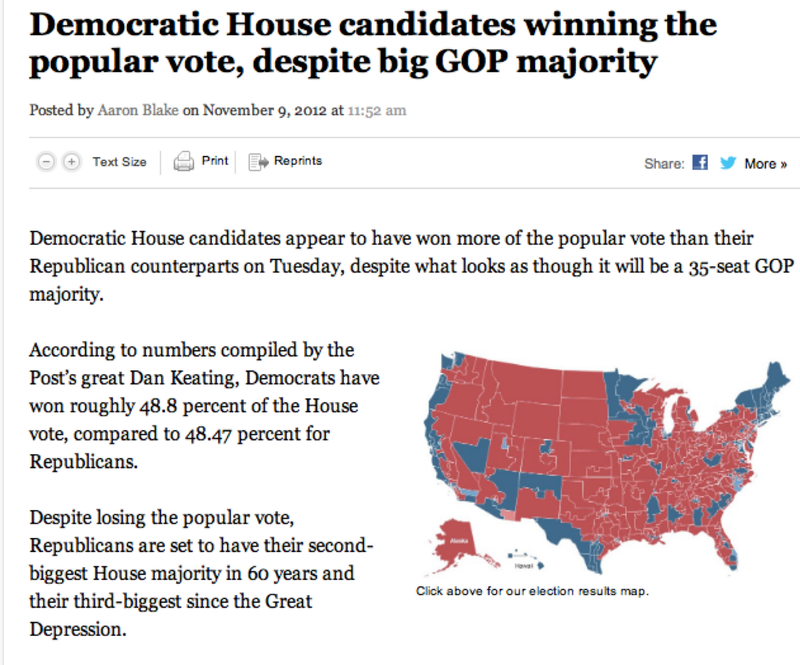 Meanwhile, the Washington Post continues to analyze the House of Representatives result (they are all over the issue, running their first article on Nov. 9), and their rough results indicate that the Democratic vote for House Members will exceed the Republicans, despite the Republicans maintaining control. There are some oddities that are affecting the final result. For instance, in a number of House districts in California the election was between members of the same party (six D v. D, two R v. R), and thus all votes cast in those races were either for the Democrats or Republicans. When adjusting for those anomalies, it appears the Democrats will still maintain their overall popular vote majority in House elections. The question I have is, what would the likely national popular vote have to be for the Democrats to emerge with a similar majority to what the Republicans now enjoy? This is hardly scientific, but in 2006, they did have a similar majority in the House, but the popular vote for House was 42,082,311-35,674,808. Just doing an extrapolation from those results indicates that the Republicans can expect to get substantial majorities by merely battling to a draw, while the Democrats need to outpoll the Republicans by 8% to get a similar majority in the House. 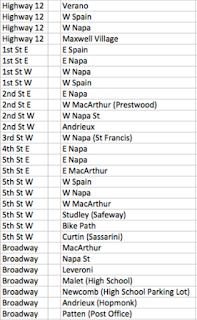 25,982 Reasons Why Pedestrian Deaths On 5th St W Are "Statistically Significant." Two people have been killed at the same intersection near my home in the last seven years. My city government believes that two deaths in that time period at the same intersection are not statistically significant. My local paper instinctively senses they're something amiss despite the city's assertion. Guess what, Sonoma Index-Tribune? I think you're right, and pro bono publico, here's what I think the problem is with the city's argument. To set the scene for non-local readers, I live in a relatively small town, Sonoma, California, with about 10,000 people (10,741, according to Google). Per the National Highway Transportation Safety Administration, there are approximately 1.73 pedestrian deaths per 100,000 population in the United States per year. 21.2% of these deaths happen at intersections. 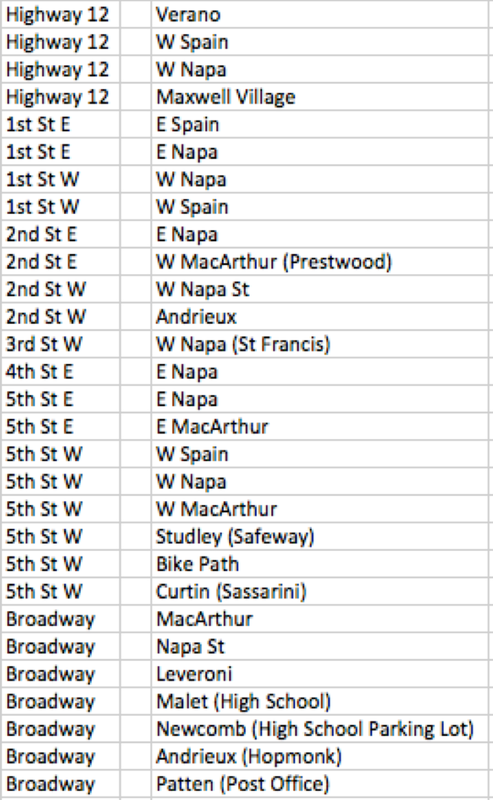 I've looked over a map of Sonoma, and there are a lot of intersections; but I've tried to count only the substantial ones -- I think there are 29 (the list is on the right). Please note that if I were more conservative, and counted each intersection, it would only make the chances of a second fatality at the same intersection less likely. Thus, I think the chance of a pedestrian fatality at any given intersection, if the intersections are roughly equally dangerous, in any given year, to be a relatively straightforward application of the multiplication rule -- it's (1.73/100000) * 10,741 * 212/1000 * 1/29, or 1 in 736. Long odds - you'd have a better chance of drawing a full house in a single draw of the cards at poker. OK, but what are the chances of getting another pedestrian fatality at the same intersection within seven years? My old statistics book from Berkeley came in handy here -- it's an application of the binomial formula. 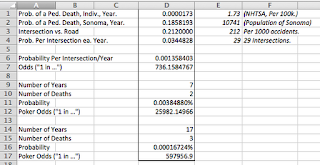 The formula is on the right; the binomial function from Excel made calculation pretty straightforward. The chances of another pedestrian accident happening at the same intersection, if the intersections are equally dangerous, within seven years, is 1 in 18,518 25,982. It's not quite as hard as drawing a straight flush, but it's pretty close. It's unlikely that Sonoma was so unlucky. Instead, it's more probable that the intersection in question is vastly more dangerous than normal. Indeed, 1 in 25,982 is somewhere between a 4σ and 5σ event; mere "statistical significance" usually requires only 2σ (95%), and anything beyond 3σ is typically "highly significant." But of course, I am no statistician, and this is all the work of an amateur. The problem is that the City staff aren't either, and I suspect they're even worse at it than me. The City shouldn't be saying something is statistically insignificant without talking to someone who has the education and experience necessary to determine that fact. This isn't a $30,000 study, it's something a grad student from UCB can handle in an afternoon. The City needs to do the work to prove this is merely bad luck, and judging by the staff report, they simply haven't. The I-T knows there's an issue here--for instance, they have been raising hue and cry about installing sidewalks in the Boyes Hot Springs area, based on the argument that pedestrians aren't safe (and they're right). The hard question, though, is whether the I-T, given the economic vise the newspaper industry has been placed in, still has the resources to challenge arguments like those advanced by the City, that in incidents of these types that "the pedestrian or bicyclist was the party most at fault." Personally, I think the I-T is on the right track, and I say, please keep pushing, because the voters are depending on you to do so, to keep us informed. And public safety depends upon you making sure our government isn't just hand-waving in response to citizen concerns -- our officials need to do the math to prove their points, and need to show us the results. Updated 4:55 PM Saturday, November 17: The odds of two deaths in the same intersection in 7 years were updated to reflect the 21.2% NHTSA figure, rather than 25%. Further, John Capone, the writer for the Index-Tribune, pointed out in his article that Beatriz Villanueva was killed in the same intersection in 1996. The chances of three pedestrian fatalities in 17 years occurring at random at the same intersection under the assumptions detailed above is 1 in 597,956. By way of comparison, the chance of drawing a royal flush in a single hand of poker is 1 in 649,739. 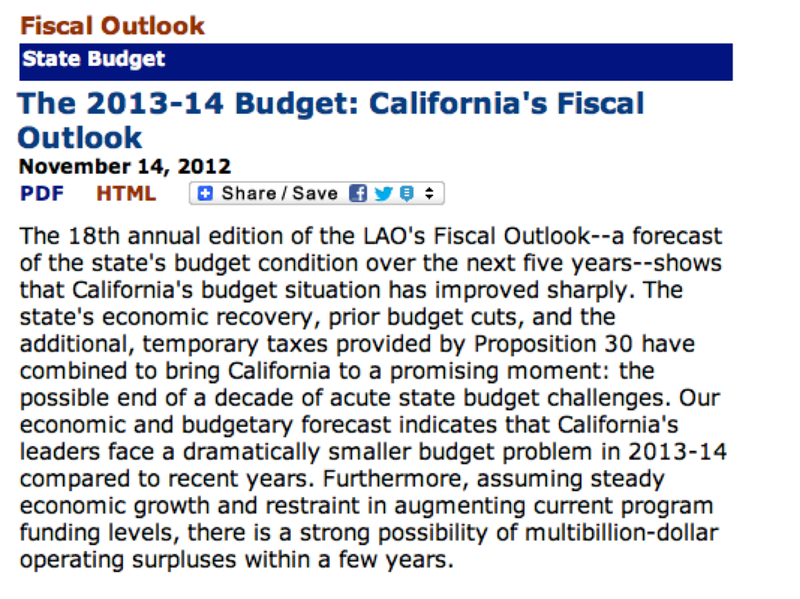 California Legislative Analyst: Yep, the Budget's Getting Better. They're a couple of days late, but its nice to see California's Legislative Analyst basically agrees that the budget situation has changed dramatically. 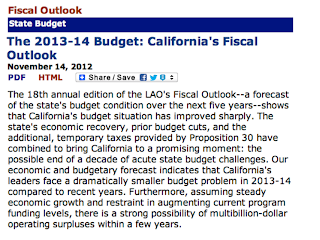 "2013-2014 Budget: California's Fiscal Outlook"
California Legislative Analyst's Office, November 14, 2012. The ability of the State to deal with the problem of prison overcrowding and Judge Henderson's order is addressed, and the LAO assumes that the State will be required to house 10,900 inmates in out–of–state contracted beds in order meet the court–ordered prison population limit, which is a part of the projected $1.9 billion deficit for 2013. The language used displays a bit of either optimism or naïveté, though, because just complying with the 137.5% deadline is the starting point for dealing with the situation, not the end point. The report also acknowledges the very substantial increases in Medi-Cal reimbursement that are expected through 2018. However, I don't think anyone can disagree that the budget situation has changed dramatically for California since perhaps June (when the ACA was upheld), and even since last week. The Democrats Are The Natural Party Of Government? Paul Krugman gets me thinking once again. This time, he's thinking that the Democrats are now the natural party of government, because they've won the popular vote at every presidential election since 1988 save one, and that was a wartime election. Paul Krugman, "Death by Epistemology"
Well, he sort of makes his point, and he sort of doesn't. The Presidency, as far as elections are concerned, is disconnected from the national popular vote by the presence of the electoral college, which encourages tactical behavior in vote seeking by the candidates. So, it's a poor proxy for determining who the "party of government" is, as far as the U.S. is concerned. I've seen people turn to governorships, to try to figure out which party is closer to the heartbeat of the nation, but that has similar problems (we're weighting California and Texas the same as Rhode Island and Delaware?). It seems to me that the very idea of the "party of government" is a Parliamentary one, specifically, the party controlling the lower house, the Commons. If we really want to apply the concept and try and see which American party would correspond, it makes more sense to look to the House of Representatives, to our lower house of the legislature, and try and get a sense of which "party" the American "popular vote" goes for by aggregating the votes for the representatives of the different parties. In the old days, that would be hard. But the Clerk of the House has thoughtfully put PDF results up with exactly those totals, dating back to 1920. I took at look at the totals from 1988 to the present; I've inferred the 2012 vote totals by taking the popular vote and subtracting 5 million -- that's about the percentage of votes that go to third parties in House elections; the final tally of seats is not complete yet (four elections yet to be called) but they're close enough to done for these purposes. The Republicans, of course, win control of the "American Commons" much more frequently, starting in 1994. But 1994 isn't an outlier -- 1992 is. The turnout in 1992 was enormous; it wasn't decisively exceeded until 2004. The Democrats held a big majority going in to the election (270 seats) and came out with 258; no party has had as big a majority in the House since. Then the 1994 "Republican Revolution" took place, and the Republicans picked up 54 seats, and they've been in control of the House constantly, with the exception of 2006-2010, since. There's one odd situation in there, 1996, where the Republicans lose the "popular vote" for the House, but still ended up in control, and 1998 and 2000 were whisker-close. Nevertheless, I think that, if you wanted to pick the "party of government," at least in the English sense, I think you would still go with the Republicans. But the data supports some other conclusions, too. No House of Representatives has had more support in the country in absolute terms than the Democrats of 2008; the number of votes they received went up by nearly 50% over 2006. It seems like ~15 million more people show up, for both sides, in a Presidential year, but not 2008; that year 22 million more people showed up for the Democrats, but only 16 million for the Republicans. I don't think anyone is surprised to learn Obama had pretty big coattails in 2008. The other thing that's interesting is how many votes the Republican Congress will have received, in 2012, when the final tally is done. The Republican majority of 2004 was the first Congressional majority to receive more than 50 million votes nationally; the Democratic majority of 2008 was the first to receive more than 60 million. One would think that this election, from a Congressional perspective, may very well be more like 1996 than 2008, with a very close vote despite the Republicans continuing to control the House. 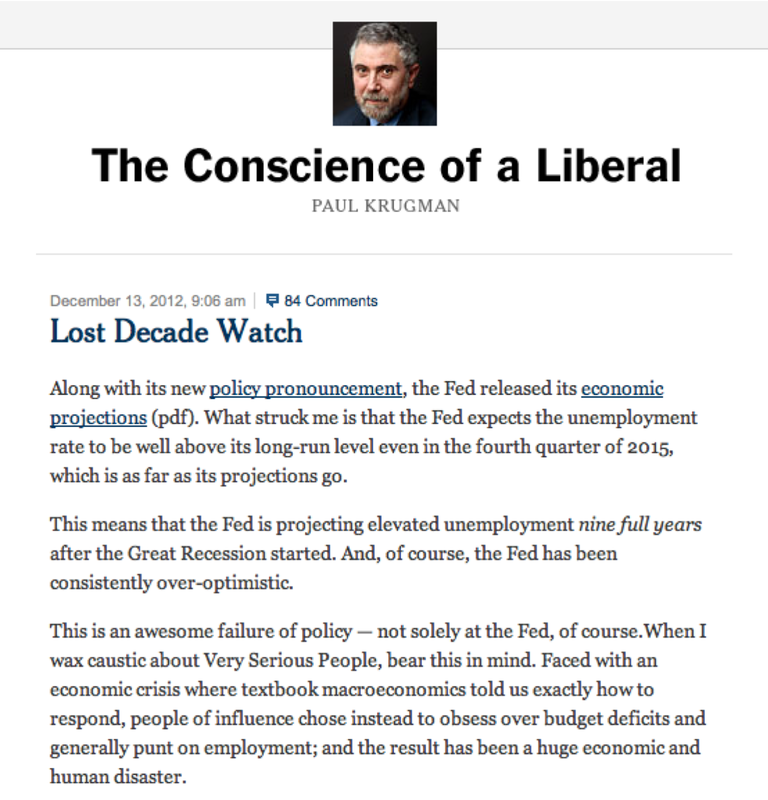 So is Krugman wrong? No -- I think he's identifying something that's real, but is drawing the wrong conclusion. His column is full of references to how the Democrats are now better organized than the Republicans. I think he's missing the fact that the Democrats have become the party of the Executive branch; of the last six presidencies, four have been Democratic. Parties that control the Executive branch tend to be better organized--after all, they have a leader. However, It's hard to control both the Executive and the Legislature--for instance, Republican candidates in different regions can argue divergent positions, but both can point to the President as a counterexample. They are not saddled with the positions of the leader of their party. All this is probably little consolation to Mitt Romney, but by the same token, Democratic presidents are probably going to have to get used to a series of Republican Houses for the near future.